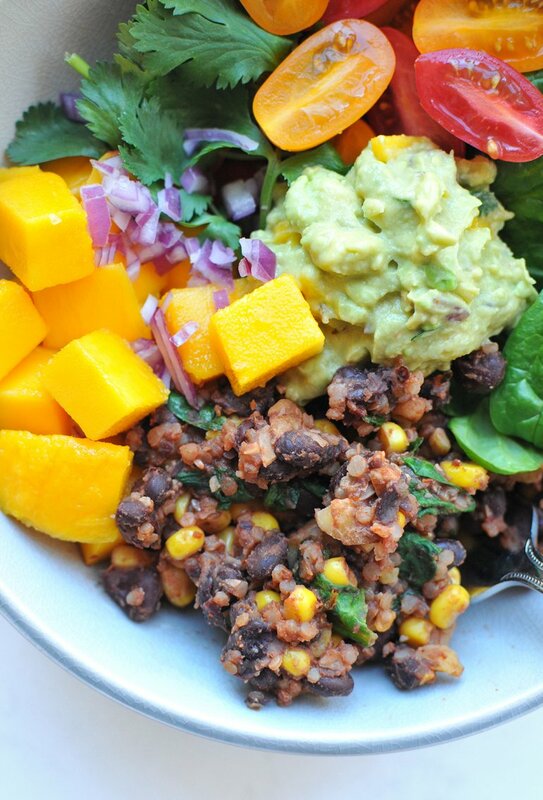 These Vegetarian Taco Buddha Bowls are full of nourishing everyday superfoods like quinoa, organic black beans, walnuts, avocado, and spinach. 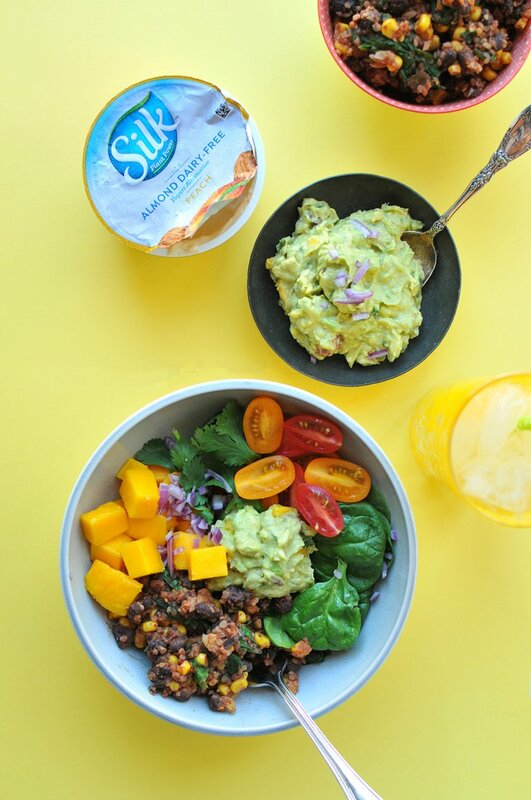 And then they're topped with a creamy dairy-free version of my popular Peach Guacamole using Silk's new peach almond dairy-free yogurt alternative. I just love nourishing bowls. Why do I even own plates anymore?!? LOL. Like this one, and this one, and this one. 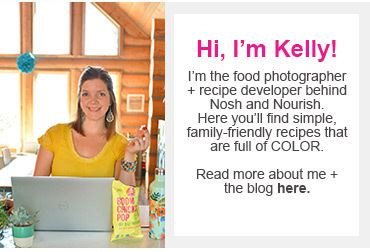 I even started a hashtag: #nourishingbowls. The key is to make them super colorful with a variety of fruits, veggies, grains, and protein. 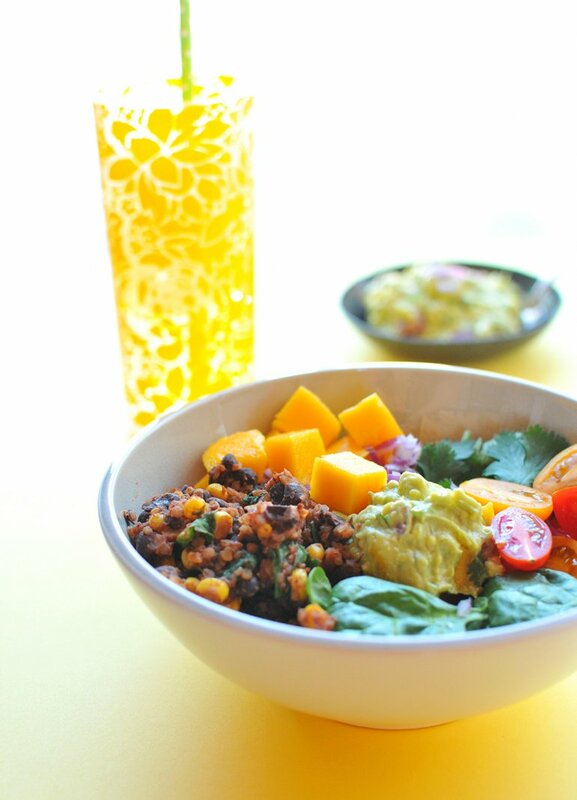 I used the base from my Beans & Greens Tacos, which is a combination of chopped walnuts, quinoa, spinach, black beans, and corn for the hearty part of the buddha bowl. Then I surrounded it with colorful, sliced heirloom tomatoes, fresh spinach, cilantro, diced mango (or you could use fresh peaches once they're in season), and a giant dollop of peach guac. Have you ever put fruit in your guac? 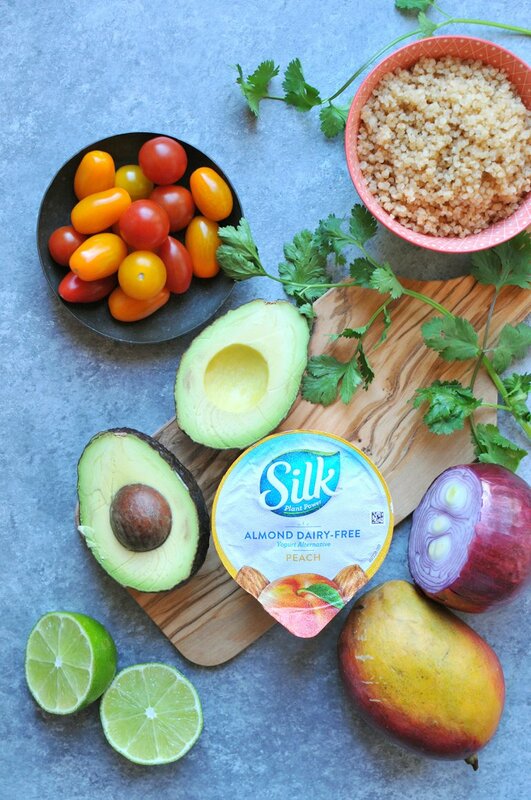 And Silk's new peach almond yogurt is the perfect substitution for the Greek yogurt in the guacamole. This is one of those super satisfying vegetarian meals that makes going meatless easy. 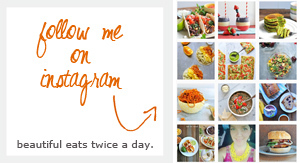 And if you have your quinoa pre-cooked (like I do on Sundays) or use one of Now Foods' microwaveable quinoa cups, then this meal can be ready in under 15 minutes! And it makes great leftovers too. Cook the beans & greens taco base. (recipe and instructions here)--- takes about 10 min. Set aside. In a small mixing bowl, mash the avocado and then stir in the other guac ingredients: diced mango, Silk peach yogurt, salsa, cilantro, and red onion. Stir until creamy and combined. 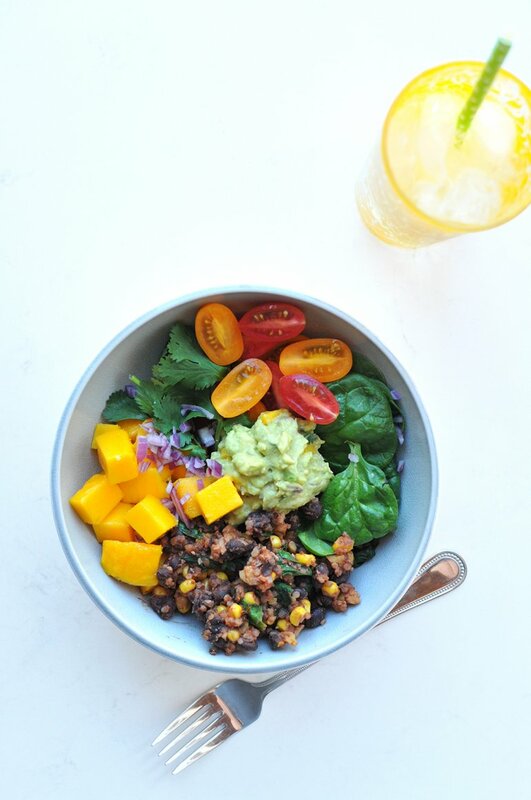 Assemble your buddha bowls: 1 cup beans & greens base plus 1 cup of spinach, a handful of diced tomatoes, a small handful of cilantro, 1/2 a mango, and a large dollop of peach guac.